Following U.S. warnings to North Korea of a "massive military response," South Korea on Monday fired missiles into the sea to simulate an attack on the North's main nuclear test site. A day after Pyongyang detonated its largest ever nuclear test explosion, South Korea's Defense Ministry also said Monday that North Korea appeared to be planning a future missile launch, possibly of an ICBM, to show off its claimed ability to target the United States with nuclear weapons. 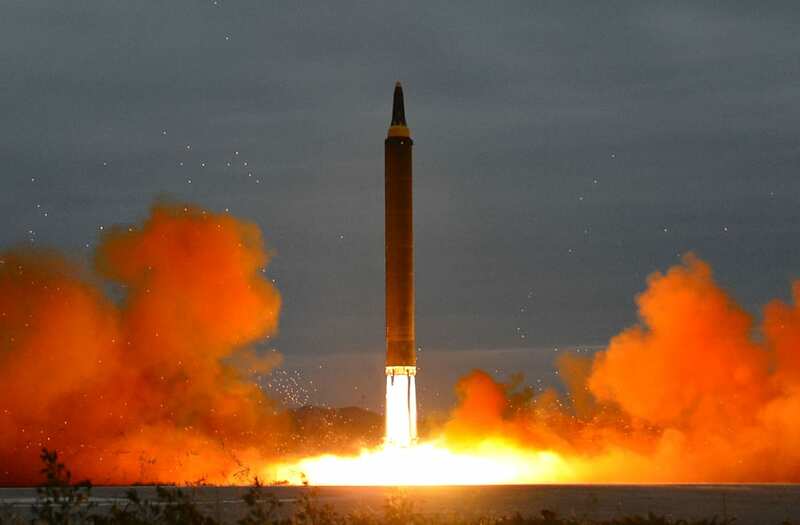 The Associated Press reported that Chang Kyung-soo, an official with South Korea's Defense Ministry, told lawmakers that Seoul was seeing preparations in the North for an ICBM test but didn't provide details about how officials had reached that assessment. Chang also said the yield from the latest nuclear detonation appeared to be about 50 kilotons, which would mark a "significant increase" from North Korea's past nuclear tests. However, a South Korean military official later told NBC News that Chang's briefing "was pointing out that North Korea is always ready for the next ballistic missile launch and this does not mean that the South Korean military is expecting another ballistic missile launch at a given set time." China also warned North Korea against launching another ballistic missile, saying it should not worsen tensions. Kim Jong Un has been very open about his regime's ambitions. North Korea regularly issues apocalyptic warnings to the U.S. and its allies. Last month, the regime's official Rodong Sinmun newspaper said the U.S. would be "catapulted into an unimaginable sea of fire" if it imposed more sanctions or threatened military action. In May, the paper said the North was "waiting for the moment it will reduce the whole of the U.S. mainland to ruins" after President Donald Trump dispatched a naval strike group to the region. Such threats have been a staple of Kim's regime since he took power after his father's death in 2011. In October, top North Korean official Lee Yong Pil told NBC News that "a preemptive nuclear strike is not something the U.S. has a monopoly on." He added: "If we see that the U.S. would do it to us, we would do it first." Asked by a reporter on Sunday if he would attack the North, Trump said: "We'll see." No U.S. military action appeared imminent, and the immediate focus appeared to be on ratcheting up economic penalties, which have had little effect thus far. In briefs remarks after a White House meeting with Trump and other national security officials, Defense Secretary Jim Mattis told reporters that America does not seek the "total annihilation" of the North, but then added somberly, "We have many options to do so." Some experts say the president now finds himself boxed in with only one real option: negotiate with a brutal dictatorship that's one of the world's most oppressive human-rights abusers. "This looks like the only option here," according to Professor Hazel Smith at the School of Oriental and African Studies, a university in London more commonly known as SOAS. "There needs to be some very brave diplomacy — diplomacy with a regime that for good reason is considered abhorrent." A missile is launched during a long and medium-range ballistic rocket launch drill in this undated photo released by North Korea's Korean Central News Agency (KCNA) in Pyongyang on August 30, 2017. KCNA/via REUTERS ATTENTION EDITORS - THIS IMAGE WAS PROVIDED BY A THIRD PARTY. REUTERS IS UNABLE TO INDEPENDENTLY VERIFY THIS IMAGE. SOUTH KOREA OUT. NO THIRD PARTY SALES. NOT FOR USE BY REUTERS THIRD PARTY DISTRIBUTORS. Whether the colorful characters leading Washington and Pyongyang have the appetite for this course of action remains to be seen. Certain members of Trump's administration have appeared more open to the idea of talks, with Secretary of State Rex Tillerson saying last month that "we're trying to convey to the North Koreans, 'We are not your enemy, we are not your threat.'" But Trump and Kim have more often favored threats and demands over nuance and olive branches. Trump's tweet following Sunday's test exemplified his approach, saying: "appeasement with North Korea will not work, they only understand one thing!" John Nilsson-Wright, a senior research fellow at the London-based Chatham House think tank, said that "there's no evidence that North Korea is ready to talk and not much from Donald Trump either." In fact, North Korea did actually appear to suggest last month that it was open to getting rid of its nukes and rockets "if the U.S. hostile policy and nuclear threat to [North Korea] are definitely terminated." But all the while, the threats and missile tests and fiery propaganda have kept coming. So how did we get to a place where the world's biggest economy and most powerful military has so few options in dealing with an impoverished pariah state with few allies? Firstly, a military strike against North Korea would be chaotic and bloody. If the U.S. launched an offensive, the North would almost certainly provoke a devastating retaliation against America's ally of South Korea. Even with conventional, non-nuclear weapons, North Korea could launch a barrage of missiles against the South's capital of Seoul, and the wider conflict could see "millions of casualties and probably millions of deaths," according to Smith at SOAS, author of "North Korea: Markets and Military Rule." These dire consequences caused Trump's former chief strategist, Steve Bannon, to conclude last month that "there's no military solution [to North Korea], forget it." While Trump has certainly talked tough — threatening North Korea with "fire" and "fury" among other things — these ultimatums have rarely if ever been backed up with action. And some analysts say these hollow warnings have only emboldened North Korea. "The United States has not mounted a coherent and visible response to several thresholds that have been crossed," Adam Mount, a senior fellow at the Center for American Progress, told MSNBC on Sunday. When North Korea achieved several important milestones in its weapons program, such as test-firing two intercontinental ballistic missiles, this "did not provoke a specific response from the Trump administration," Mount said. "That's been a mistake and quite frankly it's allowed these missile tests to continue." Nilsson-Wright, who is also a senior lecturer at Cambridge University, agreed. "It seems that Donald Trump's tactic of using rhetorical brinkmanship is not working and failing pretty dramatically," he said. The other option open to the international community is more sanctions. But as Smith at SOAS pointed out, "sanctions are not a policy in and of themselves. The question is, what do you want them to actually achieve?" Judging by North Korea's increasing nuclear and missile capabilities, the measures imposed so far have been unsuccessful in halting the regime's technological advance. In addition "any food sanctions would be directly affecting 25 million people who are living in one of the poorest countries in the world," Smith said. Military conflict and sanctions aside, that leaves the option of negotiation. Despite North Korea's appalling human-rights record, any talks would be "a good thing and an important thing to consider," according to Nilsson-Wright. North Korea is unlikely to launch a preemptive attack on the U.S. or its allies, but its weapons program worries analysts because of the scope for miscalculation and miscommunication from both sides. Entering into diplomatic talks with historical enemies is nothing new. In 1997, British Prime Minister Tony Blair started negotiations with the Irish Republican Army, a banned terrorist group that committed waves of attacks against civilians and the U.K. government. There's also precedent between the U.S. and North Korea. In 1994, three years before Blair shook the hands of IRA leaders, former President Jimmy Carter flew to Pyongyang to persuade the regime to negotiate with Bill Clinton over its nuclear program. "These gestures at the 11th hour can sometimes work, but I haven't seen any sign that Donald Trump is willing to do something as bold as that," Nilsson-Wright said. Alexander Smith reported from London. Stella Kim reported from Seoul, South Korea. Daniella Silva reported from New York.